Vibracoring Equipment - PVL Technologies, Inc. The VC-3.5.2 Vibracoring System facilitates sampling of soft or loosely sedimented saturated soil deposits using lined or unlined core tubes. It is designed for use with core tubes having nominal diameters ranging from 2” to 4” OD. 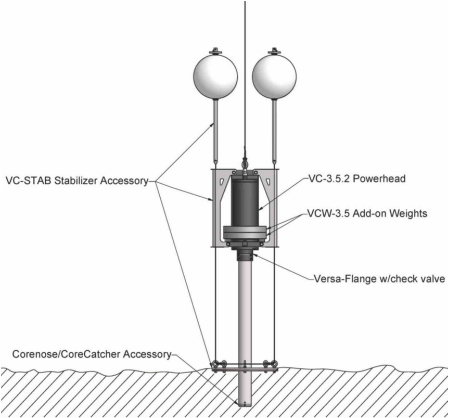 A powerful and ruggedly designed device, for use with relatively small vessels and rigging, it has been optimized to be portable, and can be deployed rapidly for sampling in estuaries, lakes and rivers, and off-shore. VC-3.5.2 Power Head is a submersible electro-mechanical device incorporating a 115 VAC, 1 HP Universal (AC/DC) motor to drive counter-rotating masses and develop high frequency (7,000 – 10,000 RPM) vibrations to enhance penetration of core tubes in offshore sediments. Submersible Power Cable w/Strain Relief comes with the standard cable length of 100 ft. Other lengths are available by special order. VCW-3.5.2 Add-on Weights utilize a vibration-isolation system to effectively increase the static driving force with minimal reduction in the vibrational energy transmitted to the sediments. Each add-on weight adds 43 lb (20 kg) of static driving force to increase penetration. The VC-3.5.2 Power Head is shipped with two add-on weights as the standrd configuration. A maximum of 4 weights can be used to add up to 172 lb (80 kg) of additional static driving force. Versa-Flange with check valve used for attachment of core tubes to the Power Head. Our standard flange accommodates 4.00 inch O.D. core tubes; inserts to accommodate other diameters are available by special order.